BONIES Natural Dental Health is a unique dog bone that uses all-natural ingredients. Made to be a healthy treat for your dog while freshening their breath at the same time. Intended for dogs weighing 15-45 lbs. Healthy Ingredients Bonies Dental Formula contain natural peppermint and parsley to help freshen breath. 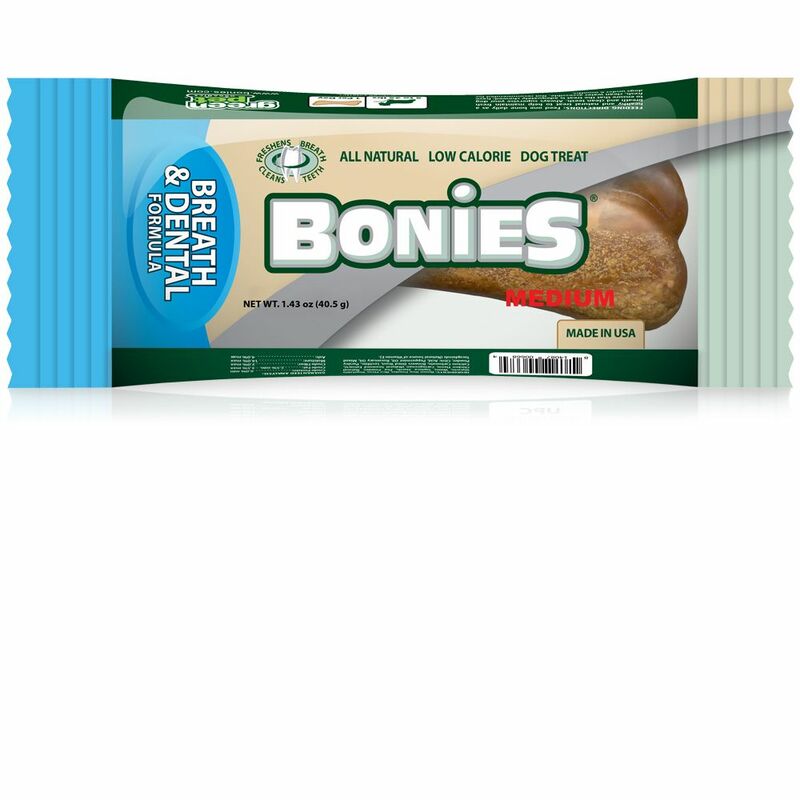 BONIES uses brown rice as its first ingredient and unlike other edible chew bones, BONIES contains no animal by-products like gelatin or animal glycerin. BONIES contains zero saturated and trans-fat. Each ingredient in BONIES was carefully selected by a board certified animal nutritionist to ensure safety, enjoyment and digestibility with no compromise to your dog's health. Bonies Benefits BONIES uses a 100% natural chicken flavor concentrate made from antibiotic-free US chicken livers. Once chewing starts, the saliva activates and magnifies the natural chicken flavor, making for a delicious but healthy and functional treat with great benefits. The combination of 100% natural peppermint and parsley create the perfect combination to freshen nasty doggy breath. Mother Nature designed bones to be hard, not soft and chewy. BONIES is uniquely formulated to be hard enough to scrape and polish teeth. While chewing a Bonies, dogs will exercise their jaw muscles and massage their gums. Medium: For Dogs 15-45 lbs. Ingredients: Brown Rice Powder, Rice Flour, Vegetable Glycerin, Water, Tapioca Starch, Pea Powder, Natural Chicken Flavor, Carrageenan (Natural Seaweed Extract), Calcium Carbonate, Brewers Dried Yeast, Lecithin, Parsley Powder, Citric Acid, Peppermint Oil, Rosemary Oil, Mixed Tocopherols (Natural Source of Vitamin E). Feed one bone daily as a healthy and natural treat to help maintain fresh breath and clean teeth. Always supervise your dog to ensure that the treat is adequately chewed; have fresh, clean water accessible. Not recommended for dogs under 6 months. My golden retriever loves them. ProsThey are good for the teeth.